A visual feast celebrating the alluring power of bookstores--68 paintings by illustrator Gibbs M. Smith. The local bookstore, a place of wonder, refuge, and rejuvenation for book lovers the world over. Books & Mortar is a celebration of these literary strongholds. Sixty-eight oil paintings capture these storefronts at a moment in time, and pair the artwork with anecdotes about the shops and reflections on bookselling by many of the owners themselves. A delightful gift for an avid reader, an inspiration for any bookstore owner, Books & Mortar is the perfect keepsake for anyone's personal library. Gibbs M. Smith, founder of his eponymous book publishing company, started the business in 1969 with his wife, Catherine, in Santa Barbara, California. After three years, they moved the company to Layton, Utah. Gibbs served as president, committed to the daily operations of the business for forty-eight years, until his death in 2017. 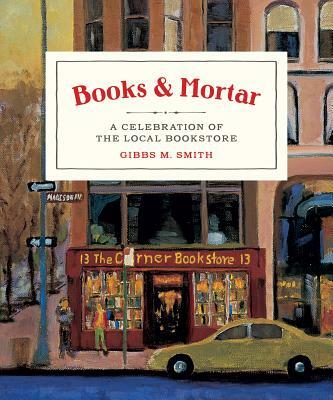 This book is a celebration of Gibbs' legacy, the local bookstores that he loved, and fifty years of Gibbs Smith as an independent publisher.